Critics who denounce Winogrand’s Women Are Beautiful as the work of a chauvinist, often fail to discuss the numerous photographs of strong, independent women in the portfolio. Winogrand presents a photograph in which the subject of the work appears upright while the surrounding cityscape tilts to the left. Unlike the photograph (Woman in a Telephone Booth, New York), the verticality of this woman emphasizes her authoritative position within the image instead of the objectifying effect created by the perspective shift in the telephone photograph. 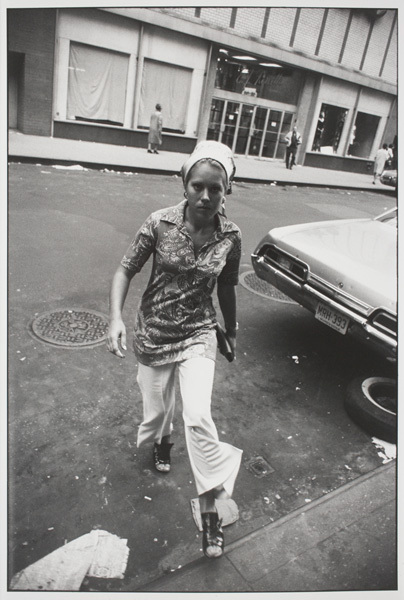 The central figure of the image can be described as fierce, even confrontational toward Winogrand’s intrusive lens. Winogrand obtained this slanted perspective by taking the photograph from a high angle. Clearly the female subject is aware she is being photographed since her eyes are locked onto Winogrand’s lens above. Despite his position directly in her path, the woman on the street assuredly lunges toward Winogrand, unflinchingly cutting through the various bits of detritus in her midst. Feminist critics can still argue that both the invasive nature of Winogrand’s proximity to his subject in this work, along with his downward point of view, serve as a kind of male-centric, domineering act in its own right. However, the primary narrative attached to this photograph hinges on the woman’s emotional relationship to the photographer. Her status as a subject, rather than as an object, is central to the work.